I always thought the entire form of the Gulf of Mexico might be the crater from the Chicxulub impact reputed to have wasted the dinosaurs. My imagination runs with that name. So much to work with. Chicxyclub…well, Club Med impact just rolls off the tongue a lot better. My notion was wrong because there are magnetically imprinted isochrons dating back to 165 mya in the middle of the Gulf of Mexico that were not destroyed or overprinted by the impact. These chrons are a hundred million years older than the impact. 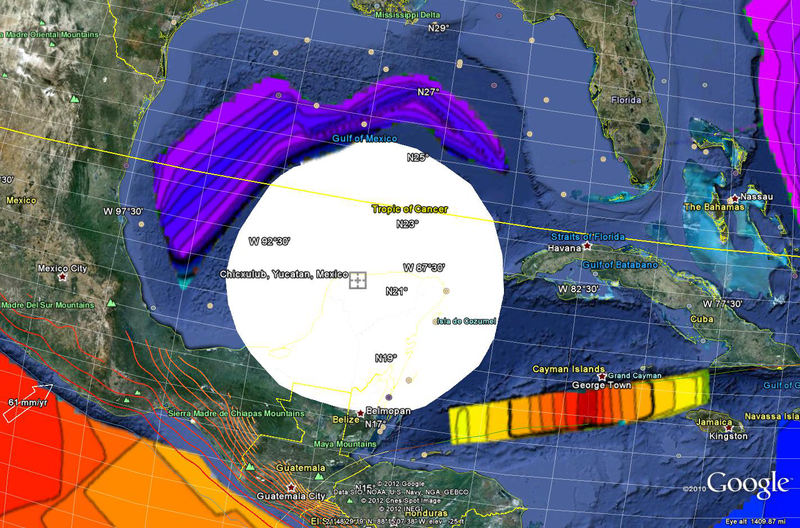 So here is the best circle I can manage using Google Earth’s Polygon Tool centered on Chicxulub. It seems odd that ground zero should be on land, but it is. Shouldn’t there be some kind of big hole here? The circle doesn’t fit very well. Maybe the real ground zero is further south and the circle bigger. This entry was posted in Asteroid Impacts, Geography, Geology, Magnetic Reversals, Oceanography, Plate Tectonics and tagged Chicxulub, Chicxulub crater, Club Med, Gulf of Mexico. Bookmark the permalink. It is worth noting that since the impact the crust has moved normal to the opening of the Atlantic and almost perfectly on latitude so that if one is looking fro signal from below the crust, the place to look is just north of the middle of Cuba today.